"He won’t stop until he’s crisscrossed the country, hitting 31 cities in 31 days, thumping the pavement with his metal legs, shoveling in carbs, showering in his RV, packing up, hauling out, doing it all over again when morning breaks. His journey started Oct. 12 in London and will end Nov. 11 — Veteran's Day. Last Tuesday, Jones ran on Belle Isle, his sixth marathon in as many days, beginning from his encampment at Bathhouse No. 8, the city’s skyline sparkling on the horizon, the Detroit River churning off his right shoulder." "I've just got to focus one day at a time," he says. "I decided I was going to do this a year and a half ago so I've had plenty of time to mentally prepare for it. I'm doing it for a reason that's bigger than myself or my own discomfort, or getting bored of running. That's all the psyche I really need." 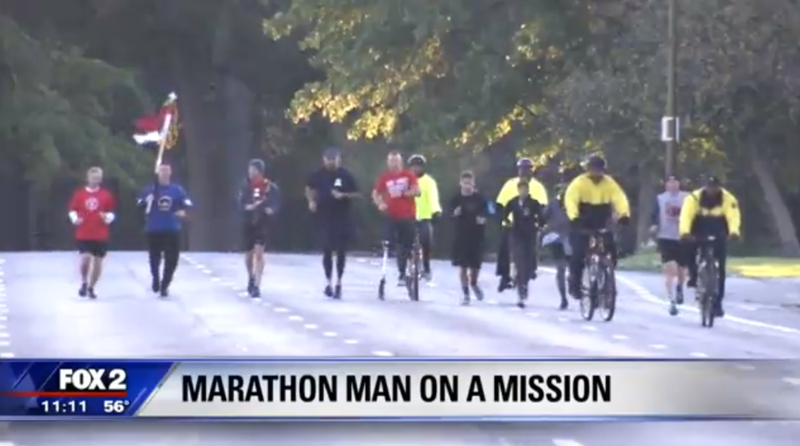 "He is planning to run 26.2 miles on Detroit’s Belle Isle Tuesday. That’s his is sixth of 31 consecutive runs on a pair of prosthetic blades. Jones, 32, is from Lovettsville, Virginia and lost his legs when he stepped on an improvised explosive device in 2010. He was on his second tour of duty in Afghanistan at the time. He also served in Iraq."